There are many days when cooking is simply not in the cards, and guess what? That’s ok! Although I do think cooking in the kitchen is an important part of living a healthy lifestyle and that you can’t live off of eating out, I do think you can make healthy choices while eating out and restaurants now more than ever are making it easier to do so. Living in Chicago I’m surrounded by restaurants the second I step outside and trying new foods at new places is an integral part of my happiness on a weekly basis! I love drawing inspiration for things I can make at home from fancy restaurant menus and experiencing the flavors of seasonal dishes with ingredients that are sometimes sourced from local farms too. And for nights when you need something faster but still want to make healthy choices there are some awesome fast-casual options here in Chicago and across the nation that have made ordering something healthy a no brainer thanks to their unique menu offerings that not only accommodate people who are gluten-free, dairy-free but who also just want to add more vegetables to their life! Below I’ve rounded up some of my favorite go-tos when I’m on-the-go and need to pick something up. During this time time of the year when things are either getting a little more hectic or finally just starting to slow down, it’s nice knowing these options are out there for when you want to make healthy eating a priority but don’t have the time to make a meal from scratch or go to the grocery store. I say use these ideas for inspo in your own kitchen too. I realize that eating out can be extremely stressful at times when it feels confusing and like there are no choices that are a good choice. Part of having a healthy relationship with food is enjoy time spent eating out with friends, etc and it doesn’t have to be daunting when you do a little bit of homework (i.e. check the menu before hand!) and rely on restaurants like these where making healthy choices is easy! I’m a huge proponent of making it work because the reality is we will not always have time to cook everything at home. These places and many more make it easy and stress free to make choices at their restaurants that ADD more nutrition to your meal. 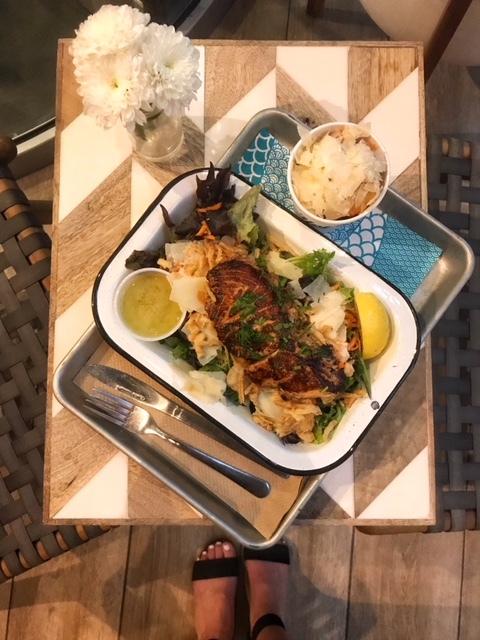 Brown Bag Seafood Co.– Fresh seafood ready in under 10 minutes?! Count me in! Everytime I eat at Brown Bag Seafood Co. I am more and more impressed by the quality of their food. With 4 locations across the city, there’s sure to be one in or near your hood! My go-to dish is a salmon salad with truffle-parm tots on the side. I like pairing a strong nutrition option (the salad) with a less healthy indulgence (the tots) to get the best of both worlds and satisfy my taste buds. That way I don’t feel deprived, and hey when I’m eating with a friend I know we’ll both enjoy them! 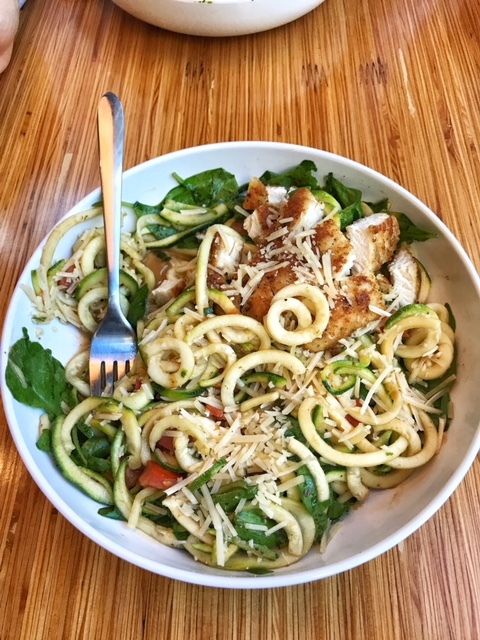 Noodles & Company – Did you hear the good news?! 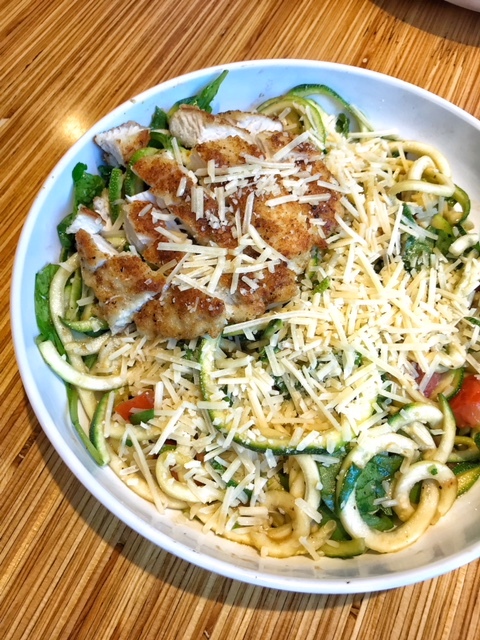 Noodles now has zoodles! Yes, that’s right you can substitute zucchini noodles for regular pasta in any of their dishes. 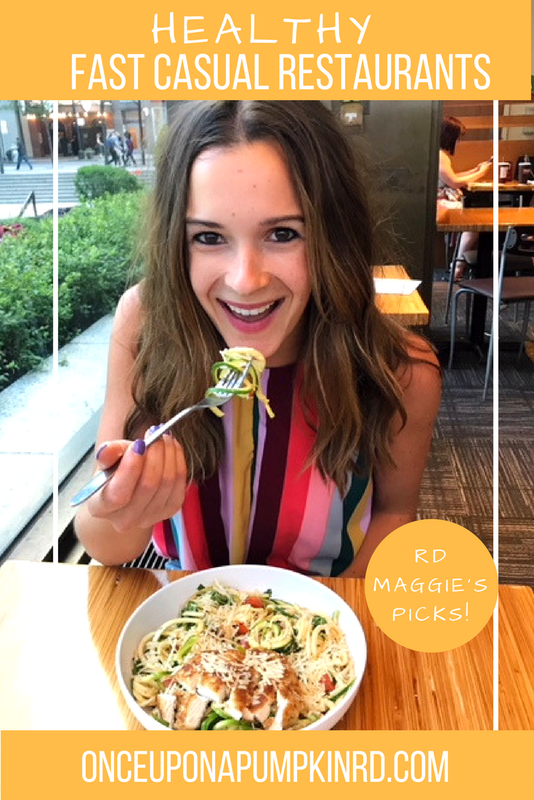 This is the perfect way to get MORE veggies into your day and trust me when I say the dish with zoodles is just as good if not better than regular pasta! And it’s a lower calorie and lower carb option. A bowl of zucchini noodles is only 60 calories and 11g of carb. My go-to dish is the pasta fresca with zoodles sub extra spinach for red onion (because I hate onions!) parmesan cheese, and chicken! Zucchini is packed with vitamin C, potassium and fiber and if you’ve been following me on Instagram you know I’ve been putting it into lots of recipes all summer long! Be sure to grab my 5 pumpkin zucchini recipe e-book if you haven’t already! p.s. on National zucchini day (August 8th, 2018) Noodles is waving the $0.75 fee for adding zoodles to any dish. Get your zoodles FREE with any dish for this one day only! 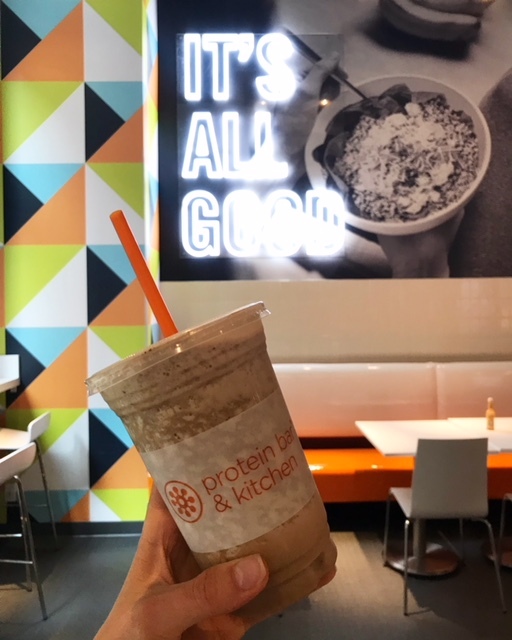 Protein Bar – This summer Protein Bar also took a veggie forward approach to their food by introducing riced cauliflower as an option to swap for quinoa in any of their bowls and salads. I had the opportunity to try my favorite menu item, the spinach and pesto bowl with riced cauliflower and it was just as delicious. Here again, this veggie swap is a lower in carb and calorie option and higher in nutrients like vitamin C, vitamin K and calcium. I paired the bowl with their new beauty brew made with Vital Proteins collagen that tasted like a coffee milkshake! 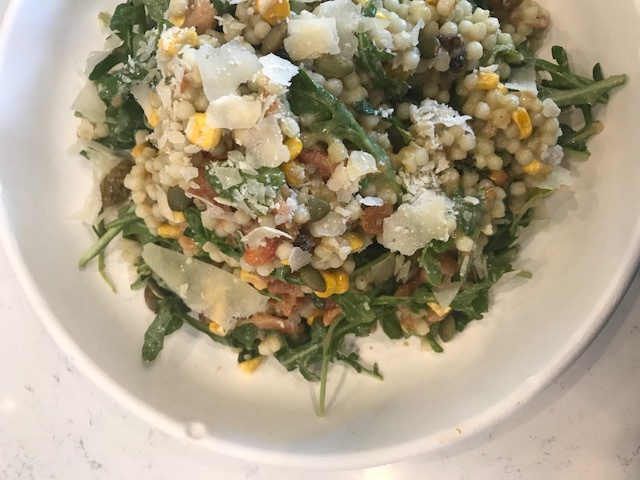 Left Coast Food & Juice– A Chicago original, this uber trendy eatery is one you will not want to miss if you live in the city or are visiting for the weekend. Think avocado toast and California vibes from the moment you walk in. Their west coast inspired menu offerings are packed with veggies and if anything else you can’t go wrong with their avocado toast! I like this place as a fun brunch or lunch spot and always get something different to eat and always kombucha on tap! Sweetgreen– A favorite restaurant of mine since I lived in New York City (and basically lived off of SG) Sweetgreen sources from local farms near their restaurants and combines some of the freshest, seasonal ingredients in their unique salad bowl offerings. Their core salads are all great (hello harvest bowl) and the rest change seasonally. Whether your choose one of theirs or build your own, you can’t go wrong with their variety of proteins, plant proteins and veggies to add to your salad. Oh, and their dressing?! All made in-house with fresh ingredients. It’s hard to pick just one, and I always get their fresh, lemony hummus on the side too! 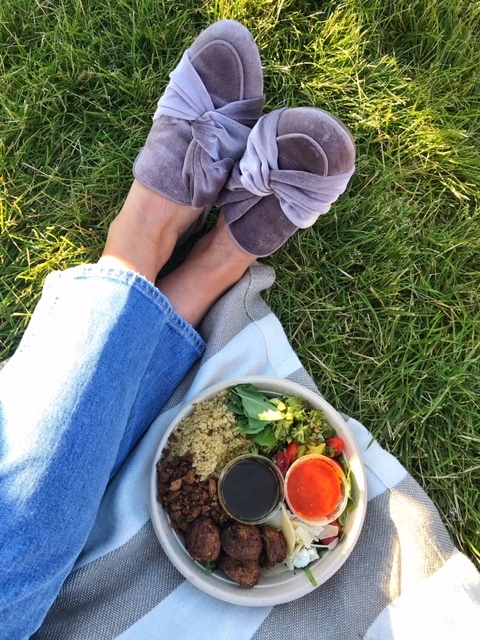 This summer I’ve especially been loving their chicken pesto parmesan bowl, which is pictured here (except in this picture I swapped chicken for falafel! ).